You will be penalized in a Google search if your agency website is not mobile responsive. In April 2015, Google announced that they would be expanding their use of mobile friendliness as a “ranking signal” to determine what websites to display on the search engine results page. 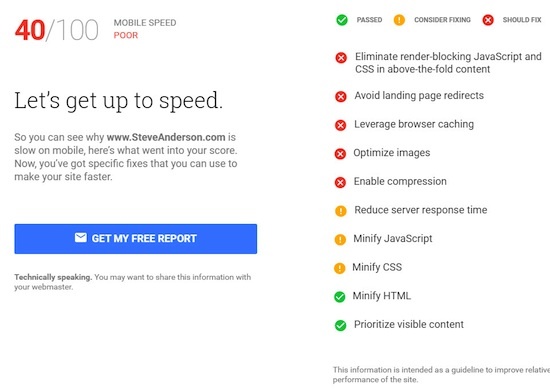 I talked about this in detail in a TechTips titled Is Your Website Mobile Friendly? The information in that issue is still valid and may be worth a quick review to understand the importance of your website being mobile friendly. In addition to mobile friendliness, how fast your site loads on a mobile device or desktop has been an important “ranking signal” for quite a while. Do you know how fast your website loads on a mobile device, laptop or desktop? Your site is graded on a 0 to 100 scale based on each of the above three criteria. I ran several of my websites through the tool and am a bit embarrassed to show you the results. I could pretend that my site is perfect, but I decided that it actually illustrates the point I am trying to make. Your website is key to maximizing your Internet presence. Too often, we treat our sites as a project and, once completed, don’t think about it again. That is a mistake. You’ll notice in the screenshot below that my scores were good for mobile friendliness, but were weak on mobile speed and desktop speed. This was an eye-opener as I assumed, because my website is mobile friendly, that it was fast also. Nearly half of all visitors will leave a mobile site if the pages don’t load within three seconds. 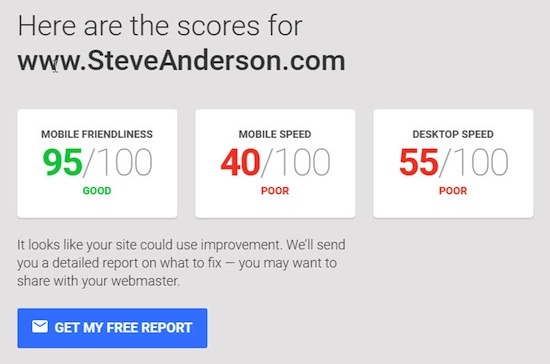 Fortunately, the test provides some concrete steps you can take to improve your website in each of the three areas tested. You can choose to have a report emailed to you, or you can view the information on screen once the test is completed. While some of the suggestions on what to fix are a bit technical, whoever created or manages and maintains your website should be able to take action to correct any problems identified. There is no question that many (most?) people begin their search for insurance information online. If your agency is not visible to that online prospect, then you’ve lost the chance and don’t even know it. I encourage you to test your website today and make sure whoever is responsible for maintaining your site is aware of and will fix any issues you discover. How often do you review your agency website to make sure it is current and up-to-date? What tools do you use to test your website? Let me know. I was surprised to see my organization’s recently updated mobile friendly site scored poorly on mobile speed and desktop speed.